At the IFA event in Berlin, Samsung has introduced a new range of Windows 8 tablets - Series 5 and Series 7, featuring the company's S-Pen stylus and optional keyboard dock. Samsung has branded these products as ATIV slates in regions outside the U.S, and also introduced a Windows RT tablet, called the ATIV Tab. Both the Series 5 (ATIV Smart PC) and Series 7 (ATIV Smart PC Pro) slates feature an 11.6-inch display. While the ATIV Smart PC Pro display has a 1920x1080 pixel resolution, the ATIV Smart PC's display has a 1366x768 resolution. Both products will ship with keyboard docks. The Samsung ATIV Smart PC Pro features an Intel Core i5 processor, 4GB of RAM and up to 256GB SSD storage, 5MP rear and 2MP front camera and Bluetooth 4.0. It has 8 hours of battery life. The device measures 304.0 x 189.4 x 11.89mm (without keyboard). 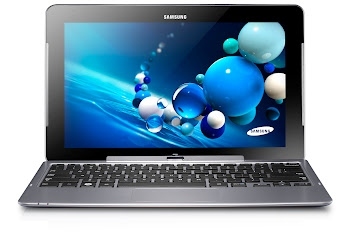 The Samsung ATIV Smart PC measures 304.0 x 189.4 x 9.9mm without keyboard. It features an Intel Atom processor, Intel HD Graphics, up to 128GB storage, Bluetooth 4.0 connectivity, an 8MP rear camera, and a 2MP front camera. The ATIV Smart PC is expected to deliver up to 13.5 hours of battery life. Check out the full specifications of the ATIV Smart PC here. It's notable the U.S.-only Series 5 and 7 Slate PCs have slightly different specifications (with different storage options), and Samsung has also released the pricing and availability of these.Samsung however, has not yet disclosed the pricing and availability of the global ATIV tablets. The Samsung Series 7 slate costs $1,199, while the Series 5 comes in two variants – one with keyboard dock costs $749 and one without is priced at $649. All of the products are slated to hit shelves on October 26. In addition to the ATIV Smart PC and Smart PC Pro, Samsung also showed off its first Windows RT-based tablet, ATIV Tab. 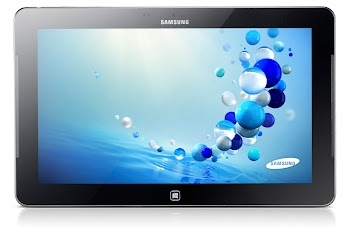 The Samsung ATIV Tab has a 10.1-inch display has a 1366x768 resolution, and the tablet is 8.9mm thick. It has 1.5GHz dual-core processor, 2GB of RAM and a mid-size 8,200mAh battery. 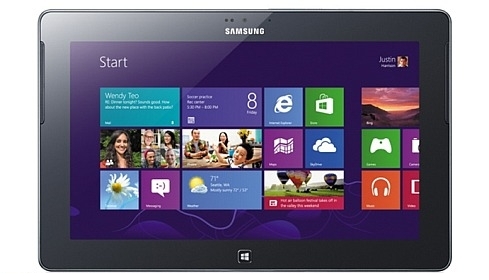 Alongside the standard Wi-Fi and Bluetooth 4.0, the ATIV Tab features USB 2.0 port and NFC. The device comes with a free 60-day trial of Microsoft Office 2010. To read the full specifications of the device, click here. Download TiGiS & BuildInG Taiwan App NOW! !